Ah yes, this notion seems to really be making the rounds lately. It certainly received a good bit of press because of a letter published in a recent issue of the British Medical Journal, which detailed the case of a 15 year-old girl who was struck by lightning while talking on her cell phone in London. Lightning is definitely something you don’t want to mess around with. According to the National Weather Service, it kills about 67 people a year and injures at least 300. And you’re not just at risk from a direct strike – the current from the discharge can travel across the ground. Yeah… you don’t want to be anywhere near a strike. So lightning safety and awareness are certainly important, which brings us back to the question at hand. I can see how people think carrying around an electrical device could make you more likely to get zapped. But think about how small a cell phone is, and really how small you are compared to buildings and other structures around you. 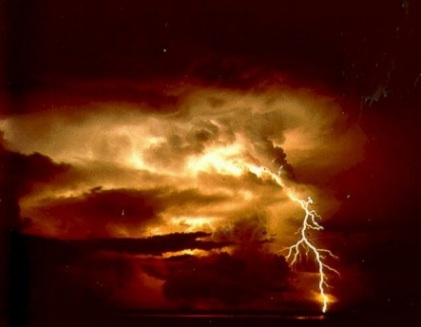 During a thunderstorm, clouds become positively charged on the top and negatively on the bottom. This separation of charge creates a strong electric field in the cloud, and as the cloud moves over the ground below, it becomes positively charged. Lightning strikes essentially neutralize the charge separation that builds up. They aren’t actually attracted to anything, but they tend to choose the path of least resistance – which believe it or not, is not usually you and your cell phone. That’s not to say it couldn’t happen, but it shouldn’t be your biggest worry. So the moral of the story is: Don’t go outside in a thunderstorm. With or without your cell phone. You certainly do bring up valid points about lightning and how carrying a cell phone has as much to do with a person being struck as a butterfly flapping its wings has on starting a tropical storm on the other side of the earth. Then again, perhaps a question and answer session on chaos theory is in order now! Don’t forget the related “cell phone while filling up [your car] at a gas station”. Thanks for the great picture and the info on how lightning is created and released during a storm. I have seen many extraordinary thunder storms and always wondered if there was a specifically chosen striking point or pattern for lightning strikes. Your column has been quick and to the point for what I was looking for. I wont use cell phone again. its a light magnet . What about ionization of air particles made by microvawes radiated by the cell phone? Lighting “searches” for the best conducting path across the insulating air. Doesn’t cellular help it to strike making conductive (ionized) air particles? Though carrying a cell-phone may NOT make one more likely to be STRUCK, I’m pretty sure that a metal object, like a belt-buckle, provides a nice entry point for lightning, if you are struck or about to be. I remember a news story a few years ago about 2 campers in a tent, on the side of a mountain in NH. A severe storm caused lightning that hit the tent. One camper survived but the other had fatal, internal injuries, as the lightning strike went into him via his belt buckle! It was in the news…so it’s true, right? Not everything is a myth. Cell phones static electricity can cause a fire at a gas station. This is proof and there are a lot of related videos. (one where a guy uses his cell phone torch to look how much gas is left in the Gasoline truck and it explodes. Its could not be determined if his phone rang at that moment). Mythbusters got busted cause they did a piece where they only let the phone ring. They did not answer it. Whats shocking is why the "expert" was lying about cell phones. Cellphones can spark cause they got batteries and there are times when batteries are loose so it creates sparks which won't set your phone on fire but can set petrol vapors on fire easily. A friend of mine had a direct hit and got a cross burnt into his chest. I had lightning strike in my bathroom through the ac duct between a friend and myself. It affected a computer, three tvs and the cell phone said do not call unless emergency, which I have never seen on my cell phone. It would not dial out either.